A former British chief prosecutor has claimed that a second “Punish a Muslim Day” is being organized in the UK. Nazir Afzal, now an adviser to the Welsh government, shared a picture of a letter inviting people to take part in the event on his Twitter account. "Here we go again Punish a Muslim Day 2 The Sequel nobody wanted July 24th 2018 Police aware & investigation being pursued - this time source will be identified," he tweeted. 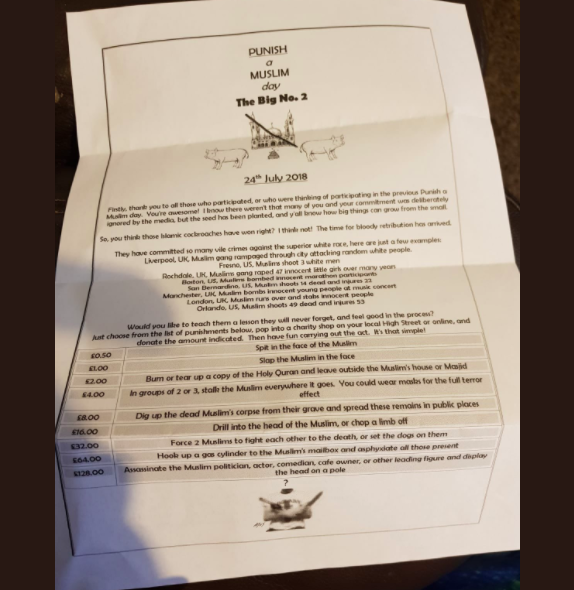 The racist event is reportedly set to take place on 24 July, after a letter allegedly emerged encouraging violence against Muslims. The letter lists a number of violent crimes suggested to be conducted against Muslims, for a price. "It is not helpful that many months later the organiser(s) of the last vile letter have still not been caught. "If you receive this letter, please try to limit the amount of handling of the letter to preserve evidence and immediately report it to the police and MEND’s Islamophobia Response Unit (IRU). "The IRU can also help you contact and deal with the police (if you choose to do so), and signpost you towards free legal advice and emotional support that may be available. "Anyone who believes they are in immediate should contact the police as soon as possible on 999." A letter promoting the first “Punish a Muslim Day” emerged in March. It had also asked Islamophobes to murder Muslims and carry out other hateful crimes against them to collect “points” for each act of hatred. “Firstly, thank you to all those who participated, or who were thinking of participating in the previous Punish a Muslim day. "You’re awesome! I know there weren’t that many of you and your commitment was deliberately ignored by the media, but the seed has been planted and y’all know how big things can grow from the small. "So you think those Islamic cockroaches have won right? I think not! The time for bloody retribution has arrived. "Would you like to teach them a lesson they will never forget, and feel good in the process?